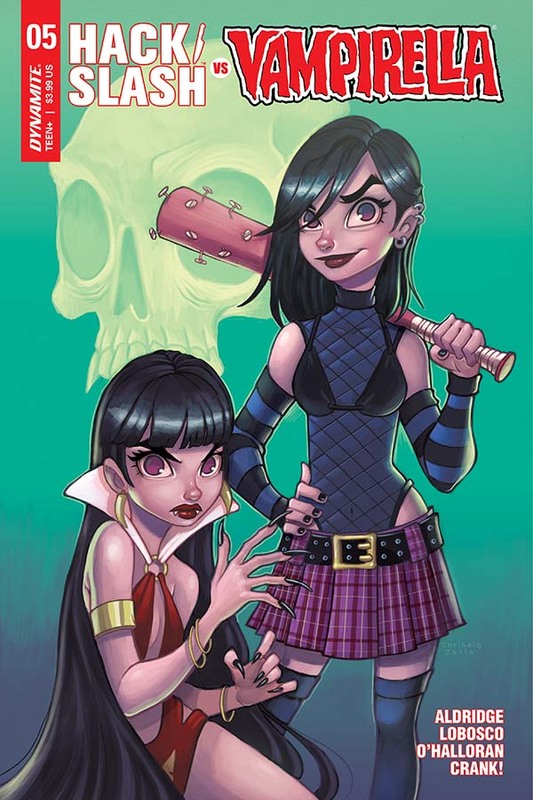 Presenting the conclusion for the crossover from Dynamite, issue number five by Shawn Aldridge and Rapha Lobsco ties the story up in a bow while keeping the door slightly open for future team ups between the team of Hack/Slash and the Vampirella. We open to a scene with the main villain, the Blood Queen, keeping Vlad hostage, as her goal is to conduct a bloody occult ritual to summon her beloved deity, the Mad God Chaos. Hack and Vampirella come to the rescue, and the team eventually disposes of the main villain in a fashion that perhaps can seem too simplistic. Tension and suspense were on the weaker side, but the writings provided us with some clever dialogue and nice humor. In addition, the potential romance between Vlad and Vampirella is strongly hinted at, which provides the strongest impetus to the notion that these characters will be seen together again. The art was good, and the action sequences were smooth and crisp. The crossover presented a cool twist on occult themes, while still presenting the audience with the stereotypical happy ending. A decent read.